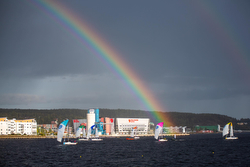 (Örnsköldsvik, Sweden)- Eighteen teams participated in the third round of the Swedish J/70 Sailing League in Örnsköldsvik, Sweden this past weekend. What transpired over the three-day event was not unexpected regards which team continued to demonstrate speed, strong tactics, and great boathandling. In the end, the overall leader of the Swedish J/70 Sailing League (a.k.a. the Allsvenskan Segling 2018), the KSSS (Royal Swedish YC), added yet another bullet to their season scoreline to count just 4 pts after three events (Malmo, Ekero, Örnsköldsvik). Nevertheless, winning for the KSSS did not come easy in this event. The inner harbor of Örnsköldsvik has very shifty, puffy winds. That combined with very short legs both upwind and downwind put a premium on “short course” tactics and positioning, as well as a very strong premium on excellent boat handling. Add in 10-20 kt winds, the speed of the race can get to you quickly, one bad tack, one bad spinnaker set, a bad gybe, a blown leeward gate rounding, all add up quickly when you are racing six teams on a short, quick track. While it was tough on the competitors, it was fantastic sport for the spectators along the quayside, literally a few meters offshore the boats were dueling for position from start to finish. Plus, a few spectacular wipe-outs (broaches) downwind kept everyone entertained. "It's fair racing, but it feels like we've been moving so fat, so quickly! You cannot relax until you're finished the race, it can be exhausting working so fast! There is so much happening during the race,“ said Tobias Bergqvist from Särö Båtklubb (the team that was in 2nd after the first day). At the end of Friday’s racing it was blowing a solid 18-25 kts! Saturday’s racing didn’t see much change in the standings. The wind conditions moderated into the 10-15 kts range, making it easier for crews to get around the race track in a somewhat organized fashion (e.g. fewer broaches and spinnaker “shrimpings”). However, it did produce a tie-breaker between KSSS and the Särö Båtklubb at 14 pts each. And, Hjuviks Boatklub was not sitting in 3rd place with 16 pts. At dawn on Sunday, everyone was hopeful for a final showdown between KSSS and the Särö Båtklubb teams. It was not meant to be, as the weather Gods instead produced 20-25 kt winds, gusting to 30 kts. A bit much for the eighteen crews looking at the loss of a perfectly beautiful, sunny, warm, day of sailing in true “blowing dogs off chains” conditions. So, the third day of racing was canceled and, thus, the KSSS won the round after only seven races during Friday and Saturday. 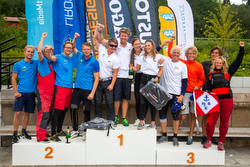 The four who won the victory for KSSS were Mikael Lindqvist, Christian Harding, Linnea Floser and Hanna Mauer. "It feels great to be on top. There are shifty, puffy winds inside the harbor, but we managed to handle them well,” said Hanna Maurer from KSSS. “Varied sailing in beautiful surroundings inspired us. We dared to make quick and difficult decisions. Our experienced skipper- Mikael Lindqvist- led the team to a tight, but lovely victory. Many thanks to the organizers who gave us the opportunity to sail on such a nice sailing arena," said Christian Harding of the KSSS crew. With three out of four rounds completed for this year's Allsvenskan, the ruling champions and favorites from KSSS have a safe lead after a second place and two wins in the three rounds. The rest of the teams are now chasing Särö Boat Club that is sitting in 2nd place with 3-7-2 record for 12 pts, 8 pts back from the leaders KSSS. Hot on their heels in third place overall is GKSS with a 9-2-4 tally for 15 pts. And, only 2 pts in arrears of them in fourth place is Hjuviks BK with a 5-9-3 scoreline for 17 pts. In short, given the wildly gyrating performances between these three teams from event to event, it would be fair to say the balance of the podium behind KSSS is wide open! The Allsvenskan season outcome will be determined in the final round in Gottskär, outside Gothenburg, from September 7th to 9th. Sailing photo credits- Daniel Stenhol. 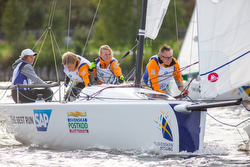 Follow the Swedish J/70 Sailing League here on Facebook. 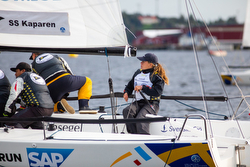 For more Swedish J/70 Sailing League information Add to Flipboard Magazine.